At the base of stunning salmon-pink cliffs, Thoreau is a beautiful chapter. These days, Thoreau is known for two things. Number 1, it's the home of Navajo Nation President Ben Shelly. Number 2, it's the place where, from late 2009 through 2010, 15 teen-agers and young adults took their own lives. The rash of suicides made national headlines, but the fact is the rate is not that much higher than it is throughout the Navajo Nation. What Thoreau should be known as is the community that faced its demons head-on and decided to fight them. In 2011, Juliana Ko, a young Teach for America volunteer who had lost one of her students in the wave of despair, decided she had to do something. She raised money to purchase an abandoned co-op building and founded the Thoreau Community Center, a bright, friendly place where young people can gather after school, browse the library or the Net, talk to counselors if they need to, have a snack and pick up brochures on everything from STDs to local colleges. Three years later, the center is hanging in there, getting by year by year on a shrinking subsidy from McKinley County and a mélange of tiny grants. According to Director Priscilla "Percy" Manuelito, the center has managed to avert 12 suicides that they know of. "And you don't always know," she said. For instance, a while back two girls dropped by the center, wanting to use the Internet. Manuelito welcomed them and offered them something to drink. They came back the next day, and sporadically over the next few weeks -- just two more faces among the 15 to 25 kids the center serves daily. "One day, one of the girls said, "You know that first time we came in here? We were on our way to jump off that cliff,'" Manuelito recalled. "'I don't want to do it anymore,' she said." Name -- A misspelling of Theroux, reportedly an Army paymaster in the days when Thoreau was little more than an Army post. The Navajo name, Dl'oo Yazhi or "Little Prairie Dog" refers to an early Anglo trader who reminded his customers of a burrowing rodent. It goes to show, said Manuelito, that it doesn't always take a lot to turn a kid around. A positive space to get away from their troubles for a while, a welcoming smile -- these simple things that can make a difference. If they need someone to talk to, Charley Long Sr. and Noreen Kelly from the Diné Council of Elders for Peace are not only trained counselors but good surrogate grandparents. Sometimes, Manuelito discovered, the kids are just hungry. And not just in the way all teen-agers are always hungry. Hungry as in not getting enough food at home. "We have a little kitchen with some snacks like popcorn and peanut butter sandwiches," she said, "but I wish we could offer them a full meal." Unfortunately, the kitchen is not up to code for an industrial food service facility, and the renovation would cost about $75,000. It's just one of many things on the center's wish list. But the center has managed to institute a lot of new activities for the kids: dual enrollment classes between Thoreau High School and New Mexico State University, an online GED course, and Manuelito's pride and joy, the new greenhouse where interested youth can learn to raise healthy vegetables. The center has applied for two VISTA AmeriCorps volunteers to help out with that this summer. Ko still skypes in to board meetings, and we were lucky to "meet" her Monday. She's a newlywed now in her home state of Florida, where she hopes to start her teaching career in the fall. But part of her heart remains in Thoreau. "It's an honor for me to work with everyone and do my part," she said with a lovely smile. Why are the youth of Thoreau so despondent? It's a bit hard to figure. The reservation line runs right through the community, and there are lots of businesses on the off-rez side: fast-food restaurants, repair places, pawn shops, even a dollar store, so it's not like there's nothing to do. But pop into a hopping place like The Bull Pen, the local burger joint, and you'll see Anglos behind the counter and Navajos lining up to spend their money. As in all the chapters along the border, the businesses do more to siphon money from Thoreau than enhance it. Thoreau's name attracts a lot of questions from tourists, and we had trouble finding a resident who could explain it. Finally we stopped at Johnnie's Inn, about the only Route 66 business in Thoreau that survived after I-40 sidelined the Mother Road in the 1970s. Johnnie's is a place for serious drinkers. If you want to sip and converse, you'd better just walk on by and find one of those sissy bars with amenities like, um, chairs. But if you're willing to stand at the bar and throw back a shot, proprietor John "Jay" Radosevich has lived here all his life and can tell you a thing or two about Thoreau. The town started its life as an Army base, according to Radosevich. It was originally known as "Mitchell," after the base's barber, and later "Theroux," after its paymaster. Somehow the spelling got changed to "Thoreau," but anyone who pronounces it "Thor-OH," as in Henry David, has instantly branded himself an outsider. It's "Thor-OO." "People think it's named after Henry David," said Radosevich, "but he never made it west of the Mississippi." The Navajo name Dl'oo Yazhi ("Little Prairie Dog"), is even more deceptive. You might think, from the number of burrowing rodents scurrying about the plain at the foot of those enticing pink cliffs that the origin of the name was obvious. But "Little Prairie Dog" was actually a derogatory nickname for one of the early Anglo traders. He was a tiny man who could barely see over the counter, and he darted rodent-like around his trading post. To complete the illusion, he had an underground storage cellar from which he would fetch goods for his customers. As with its names, there is more to this community than meets the eye. With both the railroad and I-40 running parallel through it, there is good potential for a shipping industry, but if you look at a map of the chapter you will see the reservation line conveniently avoids all of I-40 except a stretch of less than a mile, and juts into the railroad frontage in just three small spurts. The future looks brighter, with the Burlington Northern Santa Fe Railroad planning on constructing a spur from Thoreau to Farmington in 2015. 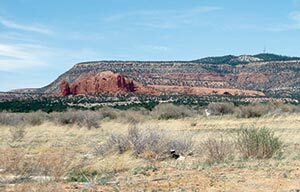 The railroad and the Navajo Nation have agreed to collaborate on a $9 million railhead industrial park in Thoreau which reportedly is already getting inquiries from interested tenants. Energy companies and the Navajo Agricultural Products Industry could benefit from the rail spur, but Thoreau's most valuable product will always be its children. Unless the influx of jobs and business can keep them from despair, there will be no way to call it a success.